Eighty Trips Around the Sun: Music by and for Terry Riley is a massive tribute in honor of the pioneering composer on his 80th birthday. A labor of love and admiration from Sarah Cahill, unquestionably one of the finest pianists of our age. It would be difficult to find a better West Coast new music advocate than pianist Sarah Cahill. A performer, educator, and writer, Cahill has championed 20th and 21st-century composers like Lou Harrison, Henry Cowell, and Julia Wolfe through her concertizing and her Sunday evening radio show, Revolutions Per Minute. Hailed as "a sterling pianist and an intrepid illuminator of the classical avant-garde" by the New York Times, she champions works from the modern era not just to preserve the art form, but more so to show their relevance and vitality in our contemporary times. Her mammoth four-disc recording Eighty Trips Around the Sun: Music by and for Terry Riley is a masterful celebration of the composer's work. Riley, a recent octogenarian, stands alongside Steve Reich, Philip Glass, and LaMonte Young as an early pioneer of minimalism in music, and his continuing output shows no sign of him slowing down or resting on his legacy. Riley continues to embrace jazz and raga influences in his music, giving his music a looser, more flexible edge than his contemporaries. The gradual, meditative shifting of harmonies and tonalities in legendary works like "In C" cemented his ideals of music as a process, one that relies on simple principles that nonetheless leave the audience in a trance. 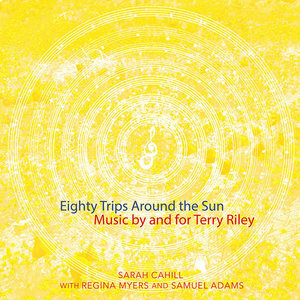 With Eighty Trips, Cahill explores Riley's relationship with the keyboard through the composer's works for piano in solo and duo settings, as well as assorted commissions from other composers written in honor and tribute of "Papa Riley". Riley is a pianist himself, and his training is a fair mix blending the structure of the classical tradition alongside the freedom of jazz improvisation. For a composer so tied to the keyboard, it's interesting to gather how the man balances the traditions of art music with a levity not always valued in modern composition. The 12-tone language of his "Two Pieces", composed in the late 1950s, revisits the cold modernity prized by Second Viennese school, yet they still burst with charm and wit. It doesn't sound like he's mocking the absurdity of the bowtie-and-coattails approach of early 20th-century art music, more so like he's mulling over the language, mining it to find severity as much as punchlines. Written less than a decade later, "Keyboard Studies" is radically different, more akin to how we perceive his style today. It's a blindingly technical piece that demonstrates Cahill's undeniable virtuosity, precise yet full of heart and warmth. The first disc compiles Riley's works for solo piano, with "Two Pieces" and "Keyboard Studies" representing the oldest works on the record. "Fandango on the Heaven Ladder" sounds like a grand improvisation, one that flirts with gestures and slinky melodies underneath a modernist ragtime vibe. Although the title references a Spanish dance there's nothing pastiche or imitative about the work. Similarly, "Be Kind to One Another" is influenced by the Indian raga, but its musical language is more informed by Thelonious Monk than Ravi Shankar. Pianist Regina Myers steps in to play solo on "Simone's Lullaby" and "Misha's Bear Dance", two pieces written for Riley's granddaughters. Rich in character and pathos, both works are based on simple ideas–a rocking lullaby, an absurd ursine grooving about–but damn it all if they're not fun listening experiences. Disc two unites Cahill and Myers for a collection of Riley's piano duos. "Cinco de Mayo" is an abstracted celebration of the Mexican holiday, contrasting rhythmic, dancelike ideas with more personal, reflective moments. The pianists are completely locked in on the work, blending rhythms and textures almost as if the same mind connects them. "Tango Doble Ladiado" and "Waltz for Charismas" toy with each respective dance form, bending and twisting them into charming character pieces. Inspired by a child from the Philippines Riley sponsored, "Jaztine" is a joyous work that skips and twirls, and beams the sunshine and wonder of youth. Closing out the disc, "Etude from the Old Country" is another technical tour-de-force of whirling arpeggios and soaring melodies. It's another stunning work, yet so many virtuosic works in a row can be exhausting on a single listen. Cahill built her career in part collaborating with composers and commissioning new works for piano. Disc three reflects this through the lens of tributes and homages to Riley. Danny Clay's "Circle Songs", set in three movements, is a collection of honest, simple reflections. Referred to by the composer as series of love songs, they travel from still and sparse to hurried and dense. "Poppy Infinite" is a contribution from Gyan Riley, Terry's son and an accomplished musician in his own right. Blending jazz, raga, minimalism, and charming pointillistic effects, it's a fusion of the elements that encompass his father's musical language, all distilled in a mysterious and enchanting nine-minute composition. Elena Ruehr's "In C, Too" takes a cue from Riley's most famous composition and builds it into a jazz-tinted romantic ode. It sways from stride piano to seductive melodies, so enjoyable it ends almost too soon. Cahill astounds throughout the third disc, much as she does on the entire four-disc collection. Her virtuosity is unquestionable, brilliant with technique and touch yet while still deeply evocative and musical. While Keeril Makan, Christine Southworth, and others provide notable contributions, the entirety of disc four is the undeniable behemoth of the collection. Lasting nearly 40 minutes, Pauline Oliveros' "A Trilling Piece for Terry". A monumental figure in American contemporary music, Oliveros' philosophical contributions to the medium rival Riley's in scope and significance. Written directly in honor of Riley's 80th birthday, "A Trilling Piece for Terry" features prepared pianos, meditative grooves, and colorful electronics that steadily grow into a staggering textural experience. It's a wonderfully nuanced composition, and a hell of a way to end the album. A four-disc compilation of tribute is a heavy way to honor a towering figure of modern music. While nothing sounds out of place or forced, listeners would be best advised to take Eighty Trips Around the Sun in segments. It's an astounding record of reflection and humor–an appropriate portrait of Papa Riley himself. A testament to Riley's influence, it's also a breathtaking display of Cahill as a formidable modern pianist.